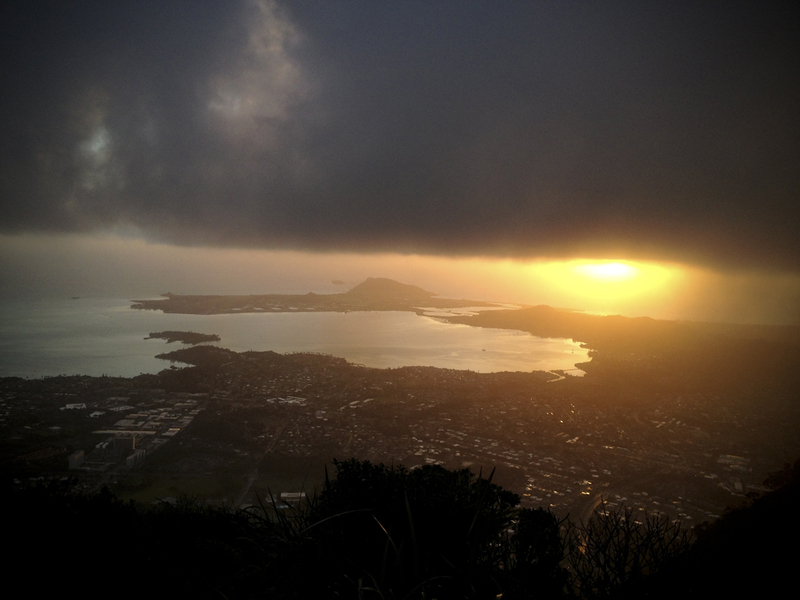 The ocean has been a bit temperamental lately here on Oahu. It seems that the winds have decided that their usual north easterly direction isn’t quite as fun as is coming in from the south, resulting in a very grumpy ocean. And because no one likes an ocean with a grumpy face, we have had to find other ways to entertain ourselves over the past few weeks…most of which have involved hiking. 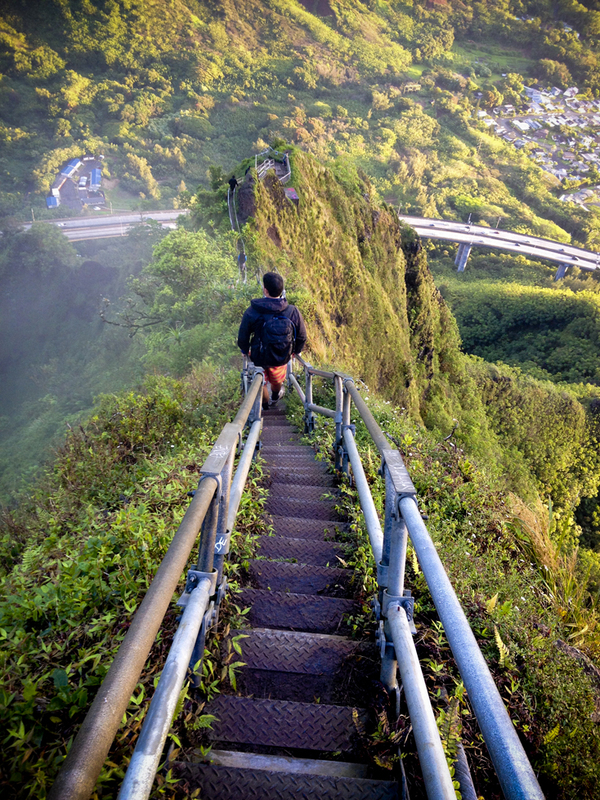 Since I first moved here in 1999, we have talked about hiking the “Stairway to Heaven,” a 4,000 stair pathway that makes it’s way up the ridge starting in Haiku Valley, Kaneohe. Today, as it turns out, was the day. Led by our friend Kevin and his friend Drew, my friends Alli, Katie and I managed to make it to the trail by 3am (which should be fairly impressive to those of you who know me). 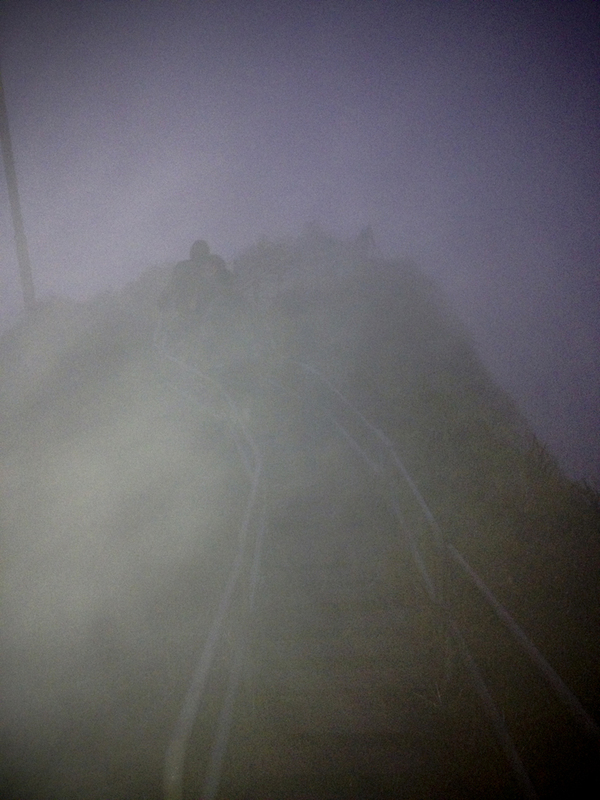 As it turns out, it isn’t easy to climb up 4,000 rickety stairs nailed to the side of a mountain ridge in the darkness that exists between 3:30 and 5am. 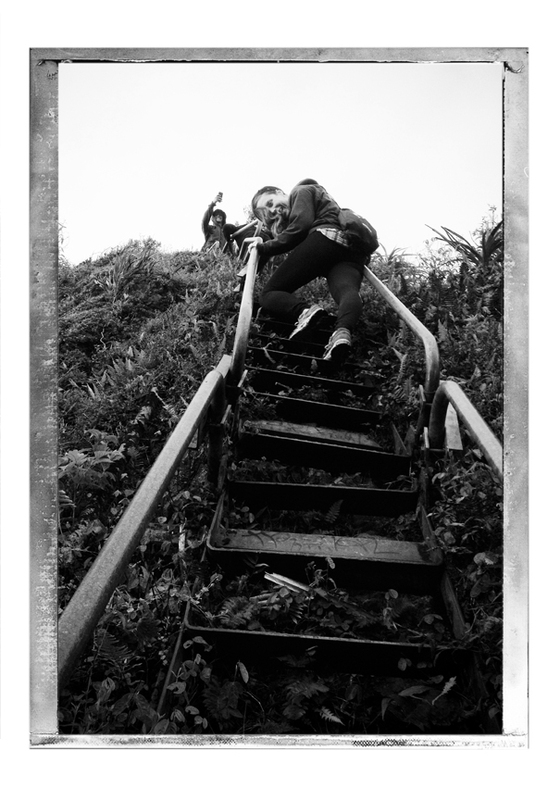 As we made our way up to the top, step by sketchy step, the only thing visible were the three or so stairs directly in front of us. 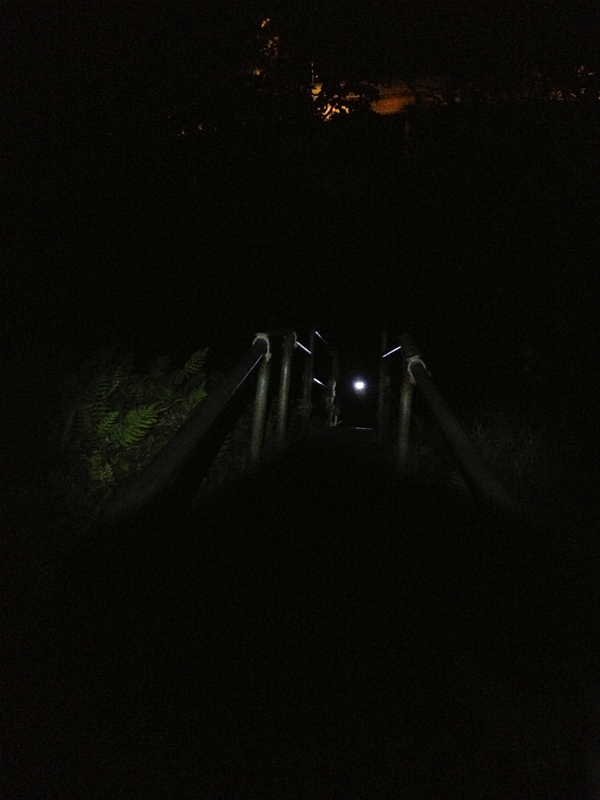 In retrospect, the darkness might actually have been a blessing in disguise…the lack of light made it easier to forget that the stairs look like this. 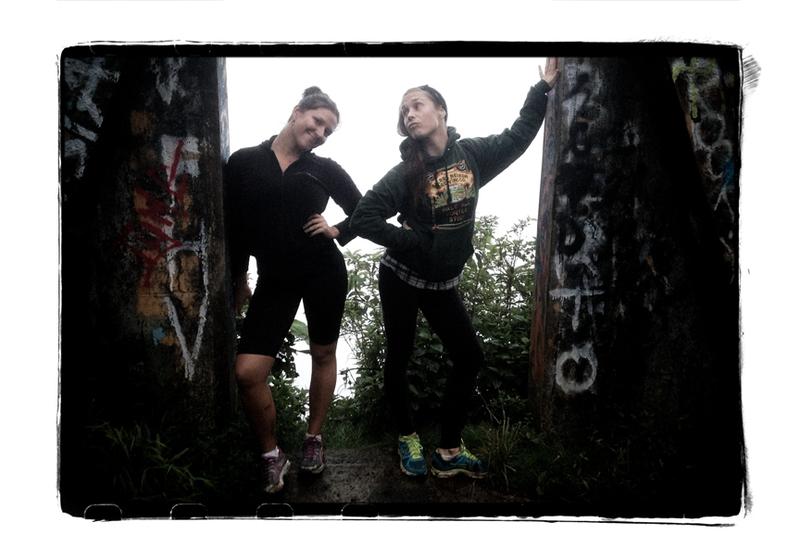 Our entire hike up was done in the dark–first through a sweaty layer of thigh-burning, cardio-pumping humidity, followed by a soggy, chilly period of rain and wind, and eventually ending up in a misty layer of clouds. 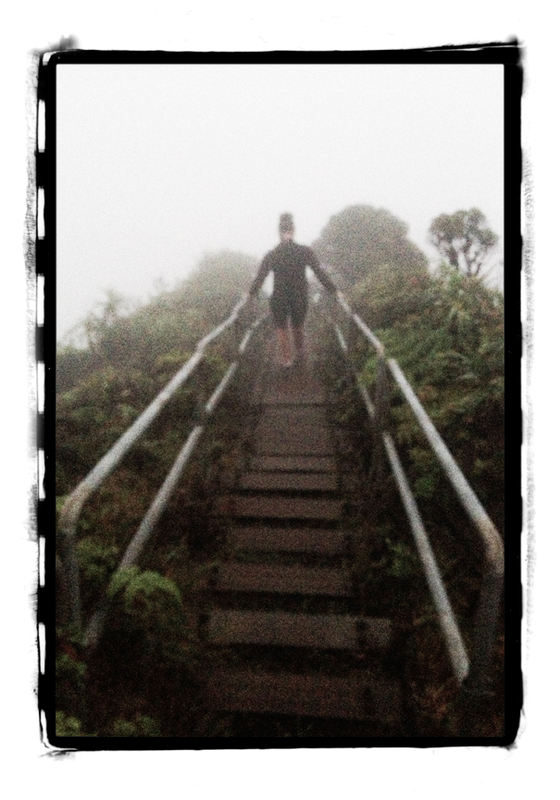 Once we had reached the top of the stairs, it had become increasingly clear that we weren’t going to be able to see the sunrise from where we were. Because of this, and also because the five of us were freezing, we decided it was time to head back down. The sky was slowly beginning to light up, making it possible for us to see for the first time what we had just hiked up through. 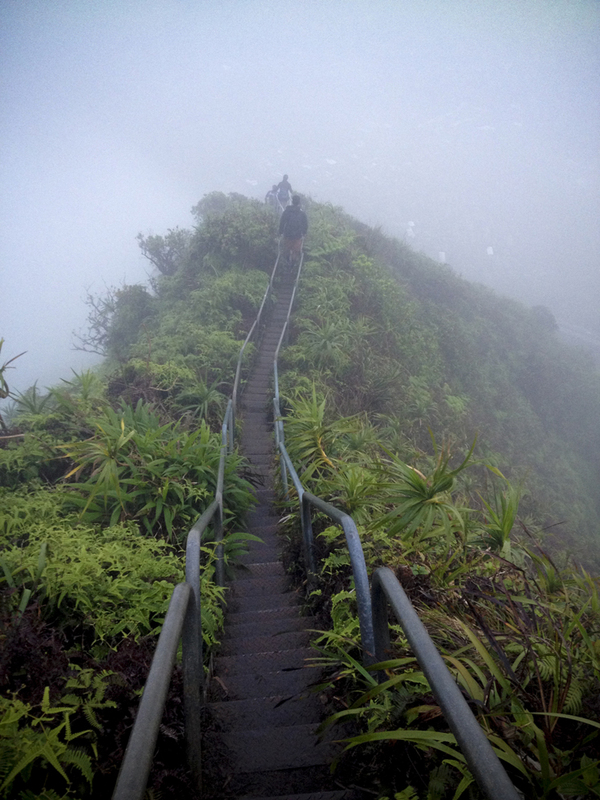 Hiking through the clouds is pretty surreal. As the sky began to light up, more and more of the trail began to present itself. 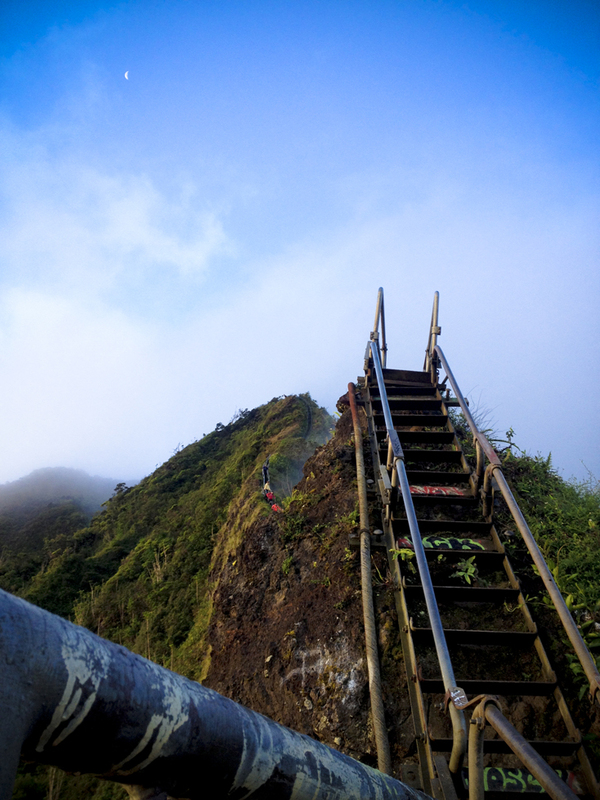 The logistics behind this hike vary depending on who you ask…because it is not exactly legal to do this hike, you have to go super early in the morning in order to get on the stairs before the guard shows up. 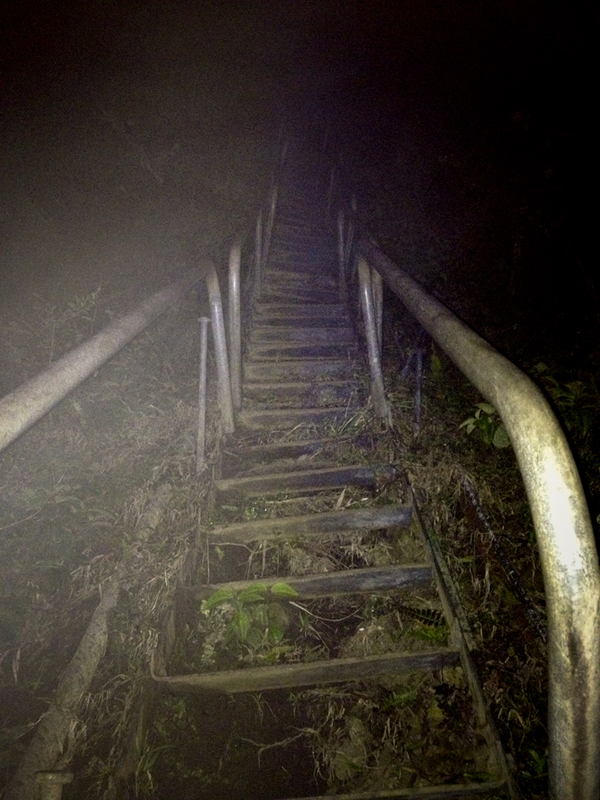 General consensus seems to be that if you arrive prior to about 3:30am, you should be fine…as long as you don’t mind scary dark staircases. 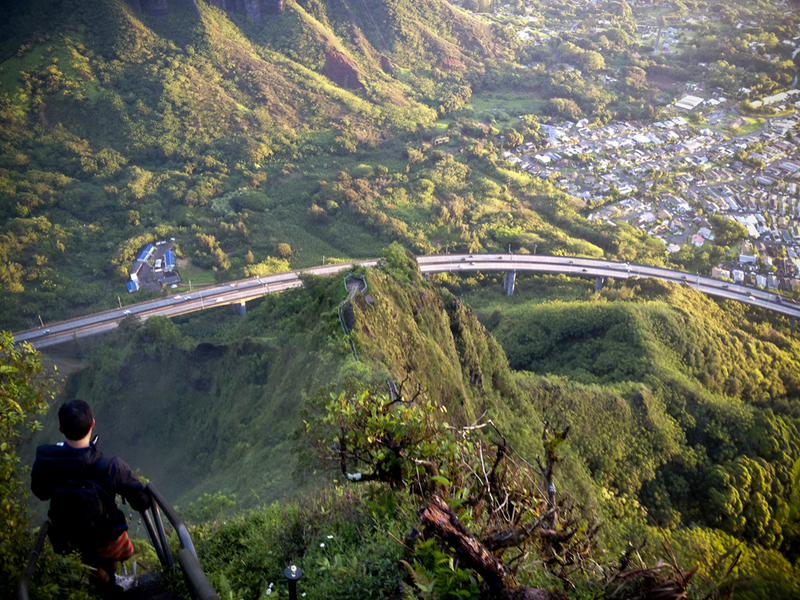 Overall though, this was one of the more intense things that I have ever done on Oahu. 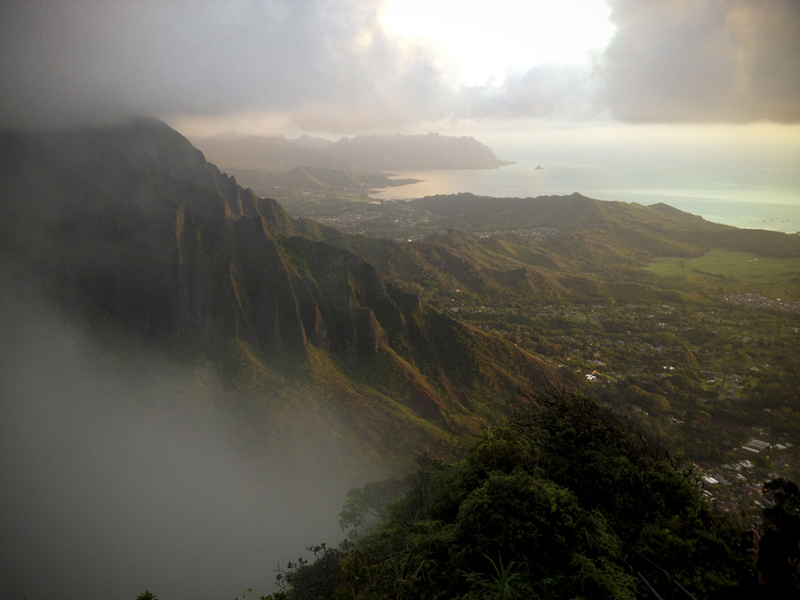 The entire experience was amazing and it is one of the best hikes that I have ever done. Having said that, due to the ridiculously early morning, the scary factor, and the soreness that my legs are currently facing, it might be a while before I try this one again. 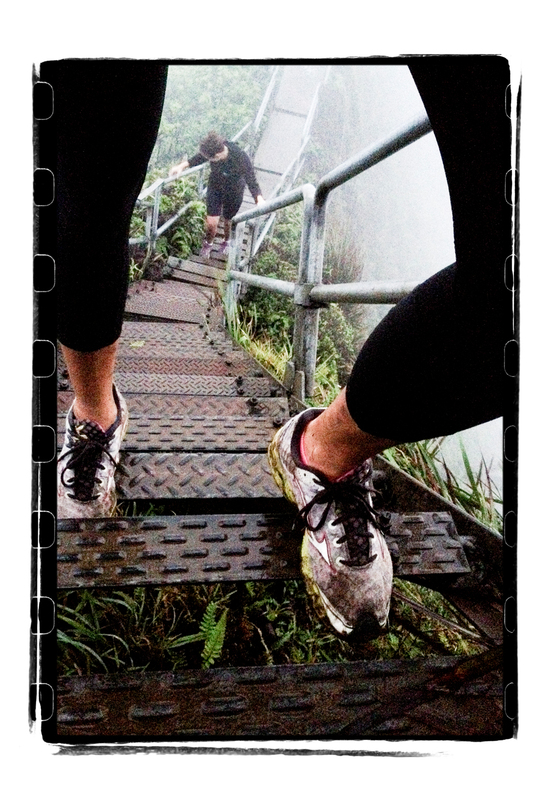 those steps are worth the walk if scenery like that can be seen! Like you say “Awesome” thanks for sharing these amazing pics !!! 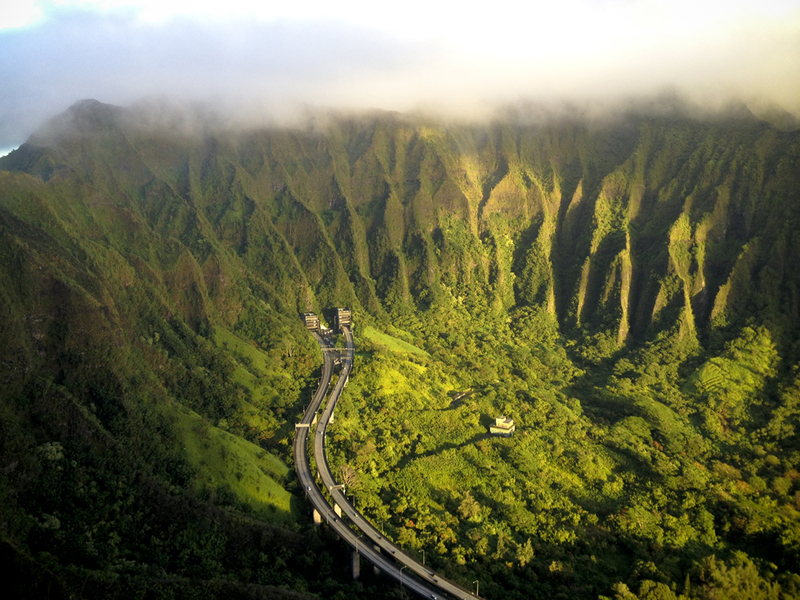 I’m going to Oahu soon on vacay…. 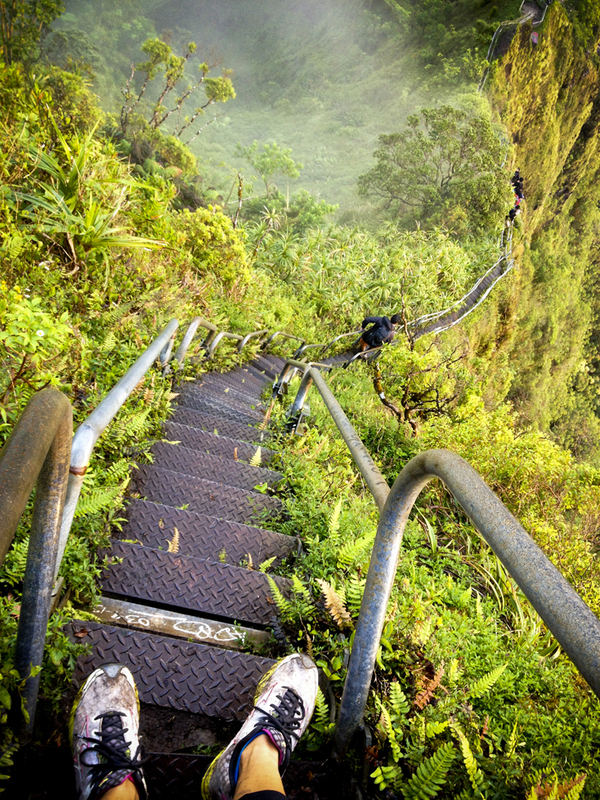 I won’t be doing that hike, because I am terrified of steep, high places. Ha, ha. 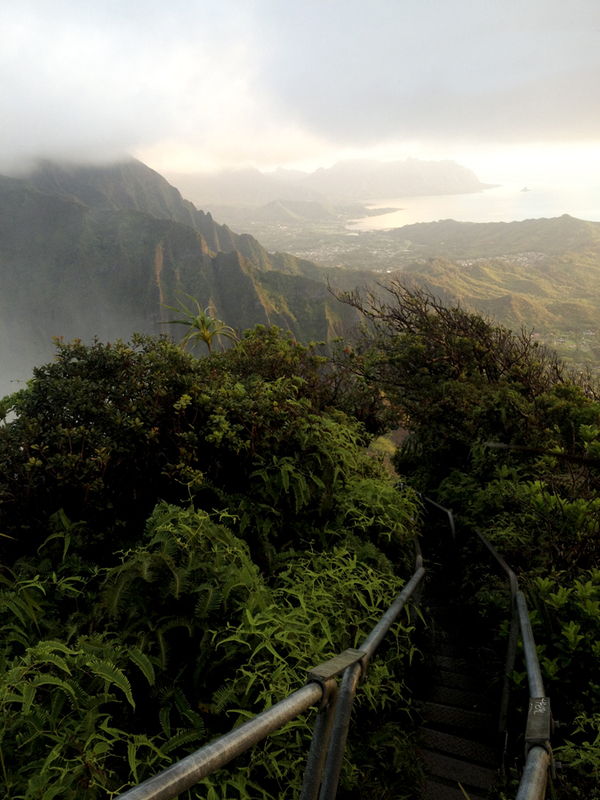 But this hike still sounds amazing and I can’t get over the views!